I have not been reading lately as much as I would like. 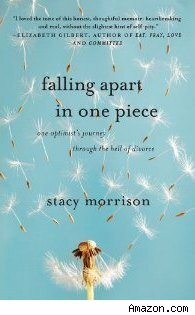 So I saw reviews for this book "Falling Apart in One Piece: An Optimists Journey Through the Hell of Divorce and I decided to order it. First let me say that usually I would not read a book about divorce since I am happily married. But, I really enjoy memoirs and I find it interesting when people can live through difficulties and share their stories of pain and hope. I was intrigued by this particular memoir by Stacy Morrison, editor in chief of Redbook magazine. Stacy captures the experience of her divorce in an emotional and honest way. So far the book is captivating and I am hooked. Have you read any amazing memoirs recently?